This DVD to Kindle Fire conversion guide or tutorial will show you how to convert DVD to Kindle Fire video and play DVD on Kindle Fire free step by step using the best free DVD ripper and converter for Kindle Fire Android E-book reader. "I want to copy my own videos to the kindle fire. I tried ripping it with handbrake to m4v and mp4. Neither has worked. Anyone knows how to convert video for the fire?" 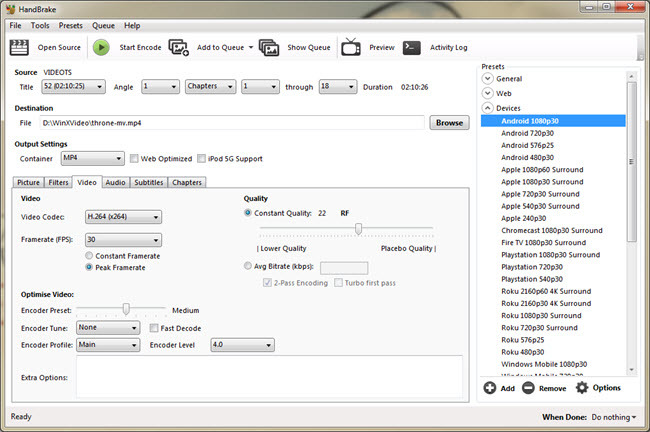 HandBrake is a widely used free DVD video transcoder for Linux, Windows and Mac OS X. However, with many problems such as outputout of order error, no titles found, only rip half way, and crash problem, as well as no specific profile for Kindle Fire, it is not the best DVD to Kindle Fire conversion tool yet. Therefore, the best solution is to find and download the best free DVD ripper for Kindle Fire (7 inch, HD 7 inch, HD 8.9 inch...). "I've tried Handbrake and a few videos that were already in .mp4 format, but neither has worked. I think the specific codecs the Fire requires aren't that common." Is WinX DVD Ripper good? WinX DVD Ripper is a totally free and clean DVD ripper for PC that supports extremely wide output video formats including Android Kindle Fire supported formats. With outstanding DVD video conversion quality and speed, it is the best free DVD to Kindle Fire ripper. With corresponding profiles made for Kindle, it will help rip copy protected DVD to Kindle Fire 7, HD 7, HD 8.9 inch or other type free and easily. WinX DVD Ripper Keep 100% original video, audio, subtitles within only 5 mins! Firstly, download the best free DVD ripper on PC. If you needs Mac version, please download WinX DVD Ripper Mac Free. Then follow the Wizard to install it before you can successfully run it. Insert a DVD disc in your DVD-ROM/drive of PC, and click on "DVD Disc" button to load the movie content. Actually, you may import the same by choosing "Folder" button next to Disc button if you have the DVD movie saved already as a folder in your computer. In this case, please make sure VIDEO_TS folder that is readable by the software is selected. You may find out that a great many video audio formats are supported by this best free DVD to Kindle Fire ripper/converter. Thus, you need to choose the most proper one for your device. 1. Click on "to MP4" button, and manually set the resolution. 1024x600 and 720x480 (recommended) at 1200kbps, at Audio Sample Rate 44100 and Video Sample Rate 23.97 are both suitable for playback on Kindle Fire. 2. Find a target device profile that is similar to your Kindle Fire 7 inch, HD 7 inch or HD 8.9 inch. For example, the general profile in the dropdown list of "to HTC" is good for general Kindle Fire users. You may optionally click on "browse" button in "Output Setting" area to self-define a place for the converted DVD video to stay, making it as convenient as you can find it subconsciously. If you are sure the previous work is done, just hit the big "Start" button to rip your DVD to Kindle Fire 7/HD 7/HD 8.9. After a moment, you will have the Kindle Fire compatible video on your PC. After you have converted DVD to Kindle Fire video with the best free DVD ripper for Kindle Fire, you may transfer DVD video to Kindle Fire from PC through cable connection, Bluetooth, or video streaming. Also, you may convert DVD to Kindle Fire played music by ripping DVD to MP3, since the audio formats supported by Kindle Fire are AAC, MP3, MIDI, OGG, and WAV. 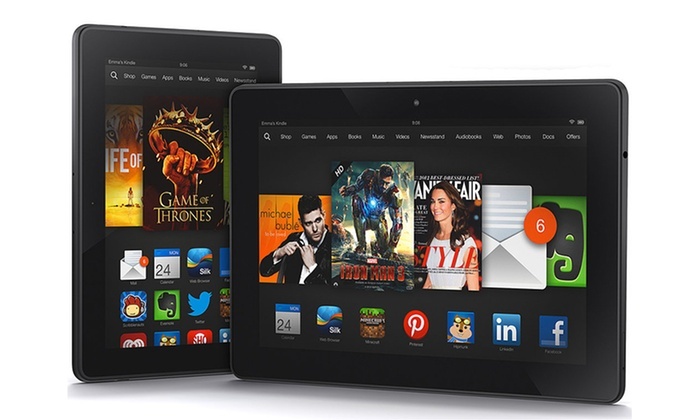 Thus, you are enabled to play DVD music on Kindle Fire (HD) 7 and HD 8.9 inch. If your personal video entertainment requirement extends to copy protected DVDs, and want to use the DVD ripper with specific profiles for Kindle Fire, please try its advanced version WinX DVD Ripper Platinum. This article will explain what the best video formats are supported by Amazon Kindle Fire, what to do if your videos are in the formats not supported by Kindle Fire tablets. This article will introduce best 3 free video converters to convert FLV to Kindle Fire (HDX 8.9 Inch) video. Here you can download the best free Android video Converter for Windows and Mac to play any videos on Android Samsung, Kindle Fire, HTC, Acer, Asus, Huawei, etc.